Physical chemistry data is readily available from handbooks, even conveniently from online databases. However it may be difficult to validate individual data points as often the source of the original data is not given or old journal article are hard to come by. Ideally computational chemistry should be able to fill the gaps, validate results and explain relations. Quantum chemistry offers standard tools to predict gas phase properties of compounds, but these are geared towards predicting energies, where compensation of errors in the methodology often allows to obtain reasonable accuracy in the predictions. For absolute properties such as entropy or heat capacity the tools have barely been tested. In the liquid state classical simulations are the best tool, but they have been shown to have limited accuracy. Here we aim to validate and improve available methods for predicting physicochemical properties of compounds in the gas- and liquid phases using large scale calculations. By performing high throughput quantum chemistry calculations of more than 2000 compounds we were able to pinpoint over 20 dubious experimental data points (paper submitted). We implemented a website (see below) for sharing the results but that was also instrumental for finding outliers (including erroneous calculations) by plotting annotated correlation plots. 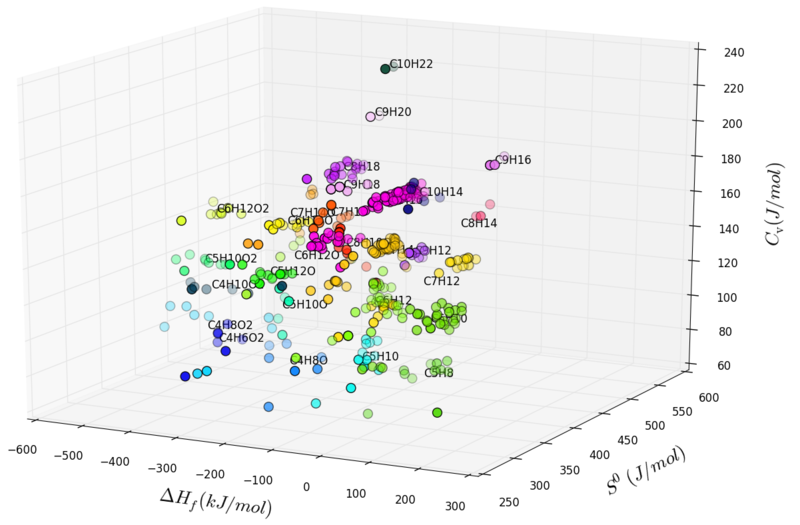 That visualization can be really helpful in this respect is also shown in the figure above, that shows the correlation between important physicochemical properties of different compounds grouped by formula. It shows how the date are clustered but also how systematic relations between properties can be rationalized (paper in preparation).